Newland Homes’ eagerly anticipated Sixpenny Wood development in Chipping Sodbury has opened its doors to local homebuyers with a three-bedroom Tetbury style showhome. Sixpenny Wood is a select 20 home development conveniently located within easy walking distance of Chipping Sodbury town centre. It offers a choice of three and four-bedroom properties in a unique woodland setting, with many homes boasting attractive stone detailing. 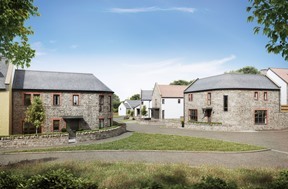 There are ten different styles of three and four-bedroom homes to choose from, with the first releases providing three-bedroom Tetbury homes, and four-bedroom Toddington and Chalford homes. The Tetbury is an attractive three storey, three double bedroom home with the galleried master bedroom suite taking the entire top floor with an ensuite and walk-in wardrobe. The Toddington is an imposing four-bedroom home, offering all the features of the Tetbury, including the impressive master suite, as well as an additional fourth bedroom and the luxury of a separate shower in the family bathroom. The Chalford is a unique architect designed home with stone detailing, a curved feature wall and contemporary open plan kitchen/dining/family room in addition to a separate living room. There are three double bedrooms plus a single bedroom, including an impressive massive bedroom suite. Gail Remnant, Associate Sales Director for Newland Homes, said: “Sixpenny Wood is an especially attractive development in an ideal location – giving buyers the peace and serenity of its wooded location but within easy reach of the High Street for shopping and entertainment.